Here was our half bath on moving day. 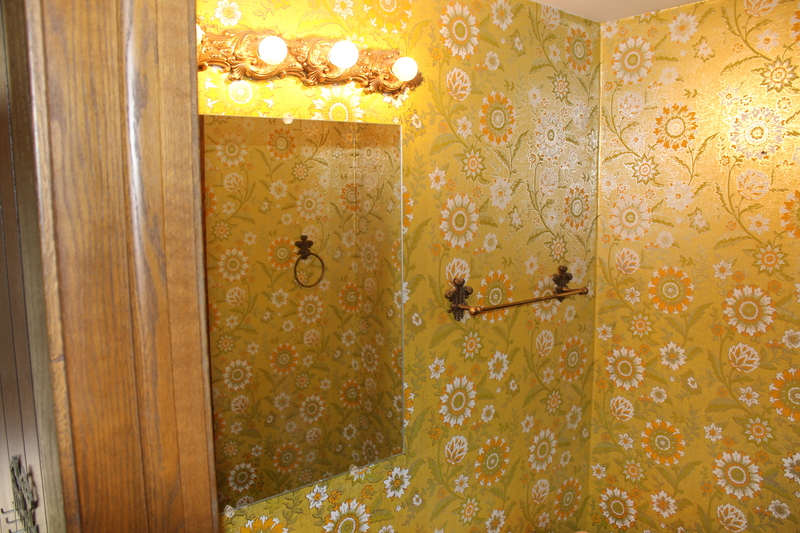 Have I ever mentioned that our house had some wallpaper when we moved in? No? Oh. Well, it did. 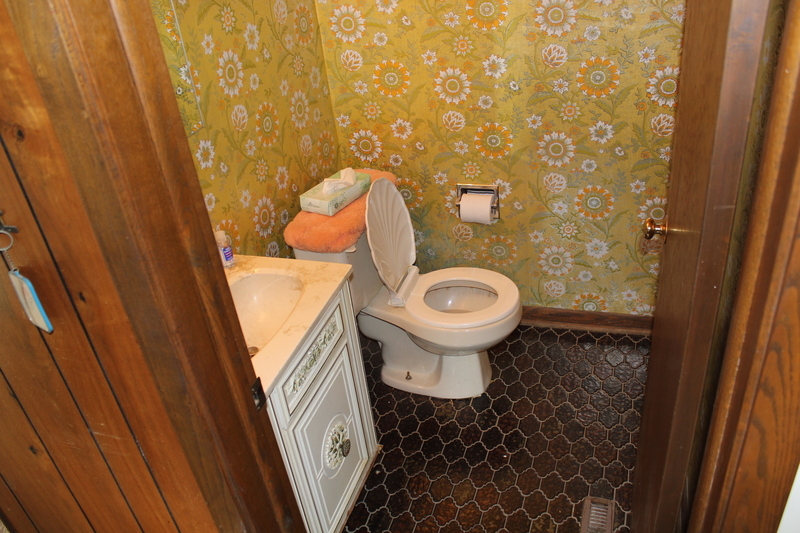 We thought about removing the wallpaper, painting, and just leaving this half bath alone for a while , but when we started ripping out tile in the kitchen and back entryway, which are both next to this bathroom, we realized it made more sense to just rip all the tiles out at once. So we did. 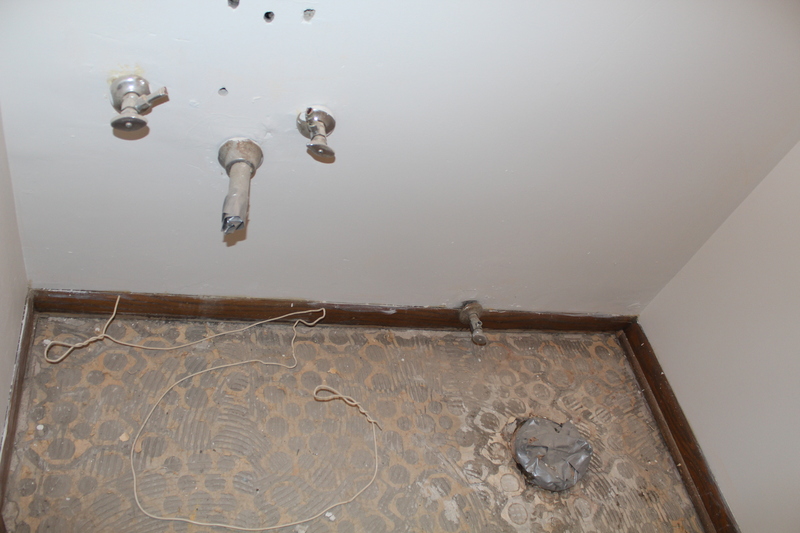 We took out everything, including the shell shaped toilet and sink and of course, the wallpaper. Getting rid of anything gave me a blank slate start, which is unusual for me. I’m in the “save everything you can to re-use” camp, so usually, my design choices take that into account. Blank slates with no direction are scary. 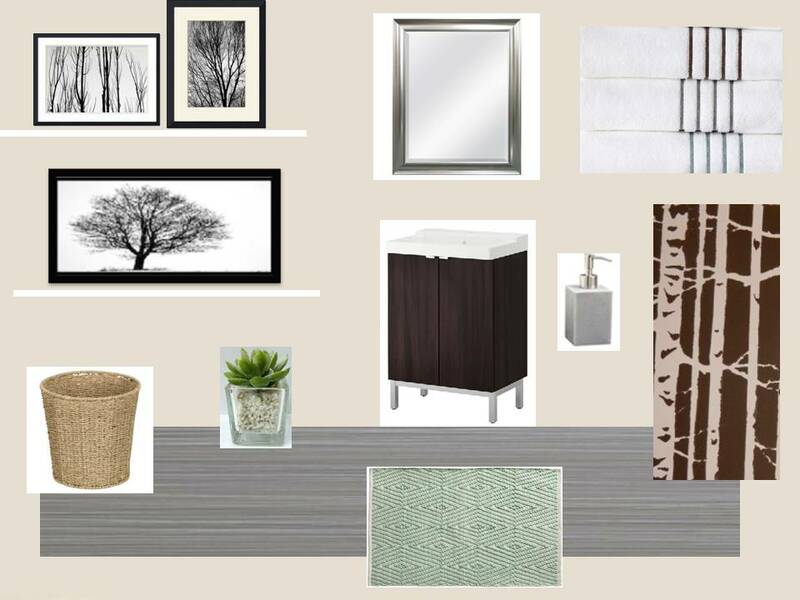 To allay some of my fears, I started off by playing around with vanity, mirror, and tile options, as they would define the room. After some online research, I came up with this mood board. I’ll just cut to the chase and show you the after photo now. Swap out an octopus for some tree branches, and it’s pretty close. The paint is the same color we have in all our bedrooms – Hazelnut Cream by Behr. As you can imagine, when picking paint colors for the whole house in a short timeframe before move in day, there wasn’t a ton of time to worry about color schemes for individual rooms. 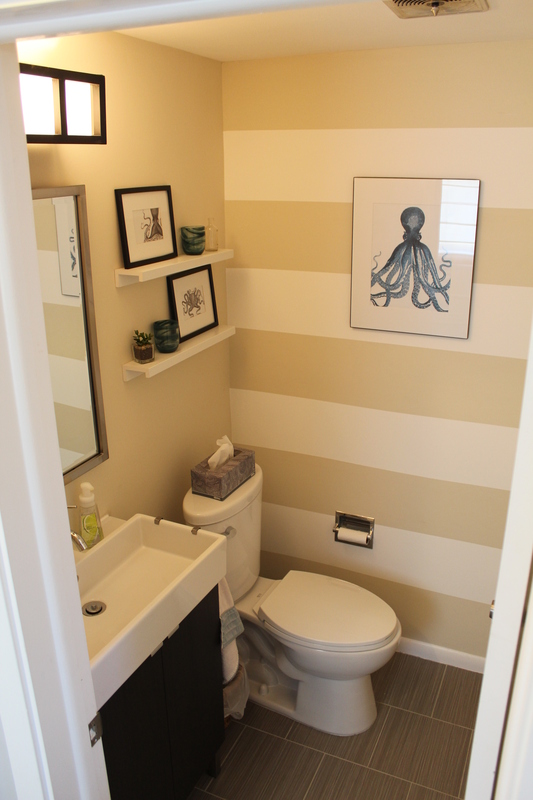 We decided the best thing to do would be to pick neutrals to get some paint on the walls, and then we could make more stylistic choices later. Those stripes weren’t painted on until just a couple months ago. We ended up getting the tile from Tile Outlet. It’s a different color of the white tile planks we used in our entryway and by the back door. Instead of getting the tiles in planks to match, we went with 12×12 squares. I wasn’t sure about the decision while we were in the store, but once they were installed, I liked that the tiles are complementary. I don’t remember the exact price, but it was budget friendly. I scoped out vanities at the big box stores, and everything that wasn’t a standard builder’s model was so expensive. I didn’t need anything really fancy, but I did want it to look nice and modern. A friend suggested Ikea, and I was impressed with what we found. We ended up going with the Lillangen two door vanity, which fit great into the tight space. It didn’t take very long to put together either. Score. For the mirror and light fixture, we turned to craigslist (as per usual) and we were able to score great deals. The large, silver framed mirror is Feiss, regularly around $250, but we got it for just $30. The light fixture is originally from Shades of Light (must be an older model, as it’s no longer on the website). I’m sure it was originally pricier than the $50 we spent on it. To add a bit of decoration to the space, I picked up 2 wall shelves from Ikea. The decorations and frames on them are just items we already had around the house. I got the vintage octopus prints for free at Graphics Fairy, and Dan sized/colored them accordingly. The light blue trimmed hand towels are from Kohls (no longer available), and the straw waste basket is a repurposed planter I got at a garage sale. Once all was said and done, the total budget came in right around $500 for everything. The biggest spends were the toilet vanity, and tiles (and installation), but I was so happy we were able to re-do this entire bathroom for less than I thought.